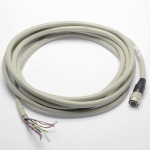 This 3 meter cable has a 12-pin Hirose connector on one end and lead wires on the other. It is compatible with the Scout, Pilot and Aviator GigE auxiliary connector for terminating power and I/O. Is is also compatible with the Aviator CL model for terminating I/O.